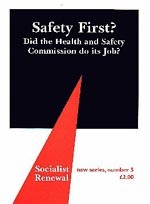 Did the Health and Safety Commission do its Job? This pamphlet is about how opportunities to protect people from abuse were taken or missed in the 25 year history of the Health & Safety Commission. Christopher Gifford, a retired HM Inspector of Mines and Quarries, and consultant engineer, examines some of the successes and failures of the last 25 years of health and safety regulation.